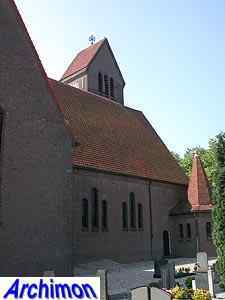 By the 1930's the old church of Leuth had become too small and a new church twice its size became needed. 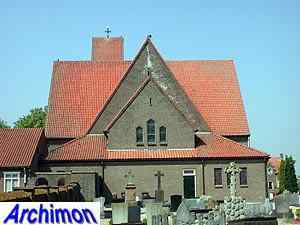 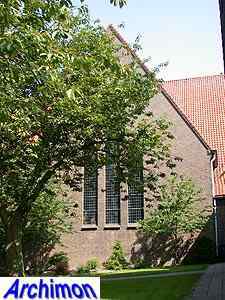 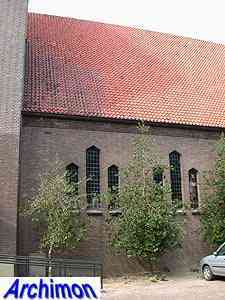 The new church was designed by architect H.C. van de Leur, who designed it in the Expressionistic style he inherited from his former employer, the French Benedictine monk and architect Dom Bellot, although this style was applied in a rather moderate form here, lacking colour and ornaments, especially outside. 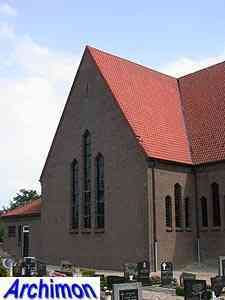 The new church, a one-aisled cruciform building, was built at a new location and was made the centre of a new square. 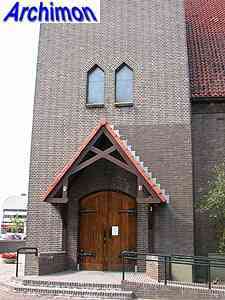 The architect made several designs before settling for this one, which incidentally won a prize at an exhibition. 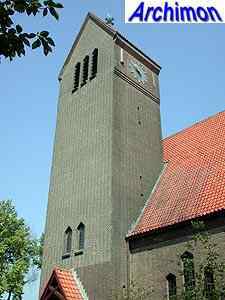 An early design had the tower with an entrance centrally at the front of the church, with the roof following the axis of the nave. 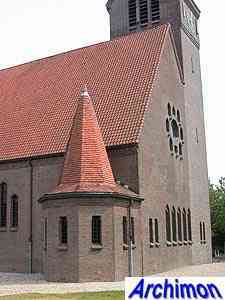 A later design had the tower at the current position, but still with the roof following the direction of the nave. 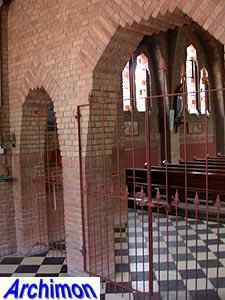 Other designs show the church largely as it is now, only with details like more elaborate sounding-holes or a small tower next to the choir. 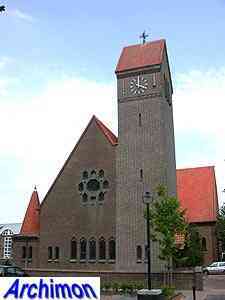 A bit peculiar is the rose-window in the facade, which is only centrally positioned if the tower is considered a part of the facade. 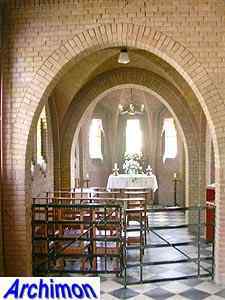 On the other side of the nave is a polygonal baptistery. 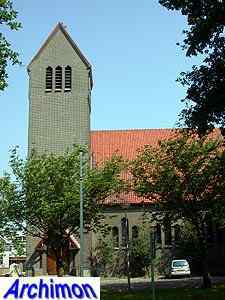 The entrance to the church is at the side of the tower. 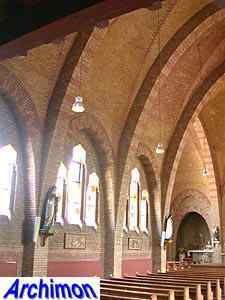 The one-aisled nave is covered by a series of brick parabolic arches with brick vaults inbetween. 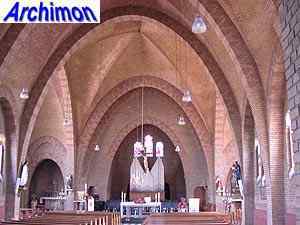 The arches are supported by buttresses within the walls. 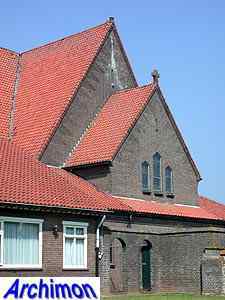 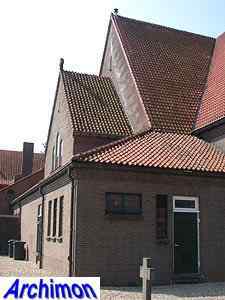 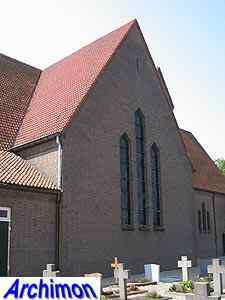 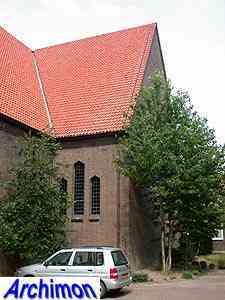 Different colours of bricks were used in the interior, which nonetheless isn't as colourfull as several of Van de Leur's other churches, like the St. Gerardus Majella in Utrecht which was built in the same period. 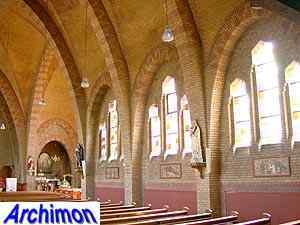 Also in contrast to the architect's other churches, this church has a simple short rectangular choir. 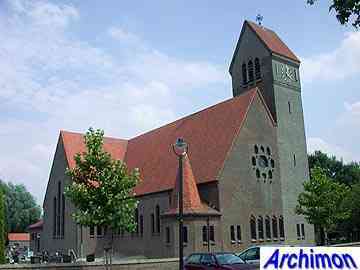 At the end of the Second World War the church was severely damaged. 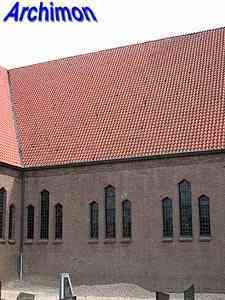 After the war it was restored to its original state, only using a slightly different colour of brick, which now shows the extend of the damage.